There is a problem with the inevitable reflexive warnings after every vicious attack not to slip into Islamophobia. A short personal history of how France got here. The great French comic artist is now working at the height of his considerable powers, and he is obsessed with questions of Jewish identity and life in Europe. It is sad to watch the territorialists engage in their wild goose chases all over the globe at a time when multitudes of Jews were in need of a place, any place, to go. This is a sad story, one that begins with Sarah Wildman’s discovery among the papers of her grandfather, a physician in Massachusetts, of a file of letters dating back to 1939–1942. Assaf Gavron’s The Hilltop is a refreshing reminder that traditional realism is still an effective vehicle of insight into contemporary society and politics. Sylvia Rafael: The Life and Death of a Mossad Spy opens not with an intrepid secret agent about to pull off a bold maneuver, as books with such titles usually do, but with nine men gathered around a table in 1977, studying a picture of an Israeli agent. Whatever kind of Passover Seder one attends, there is a fifth question, usually whispered, that arises some time after the first four are asked . . . When it came to New York’s Metropolitan Opera this past fall The Death of Klinghoffer faced angry—and, it must be admitted, some pretty shrill—demonstrators. 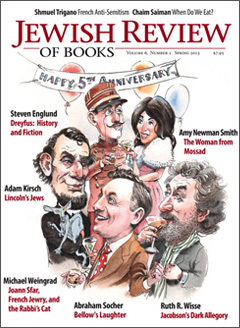 The JRB editors celebrate our fifth anniversary with our top-five book lists.